Special tag is a piece of text that you can add to any part of the gallery to display the image or gallery information automatically. When the gallery is generated all special tags are replaced with the actual values. For example, the [#gallery.imagecount#] tag is replaced with the number of images in the gallery and the [#gallery.createdate#] tag - with the gallery creation date. This gallery has [#gallery.imagecount#] images. It was created on [#gallery.createdate#]. This gallery has 25 images. It was created on January 15, 2007. You do not have to remember all the special tags. Whenever you need one simply click the ... button next to the edit field (if it has one). 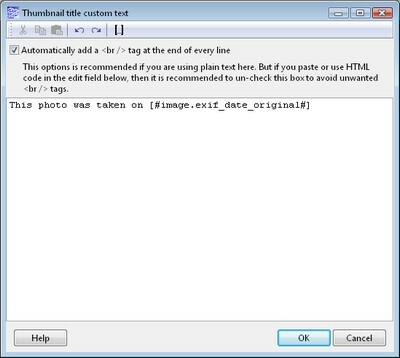 This button opens the multi-line text editor for the that field. For example this one was open for the thumbnails title. Now to add a special tag to the text click the button. 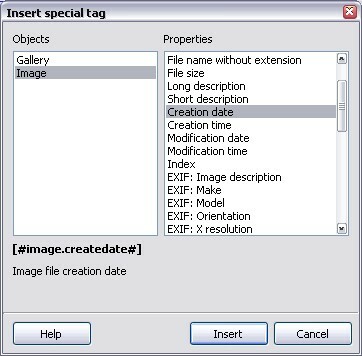 It opens the Insert special tag window where you can choose the tag you need.